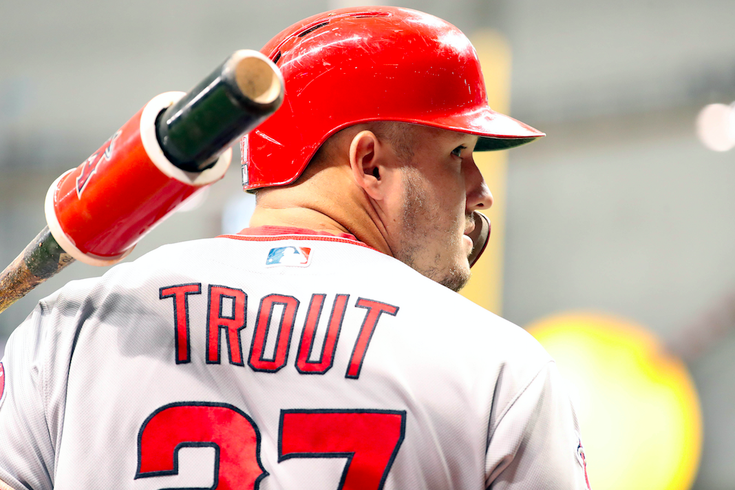 Los Angeles Angels designated hitter Mike Trout stands on deck to bat against the Tampa Bay Rays at Tropicana Field on Aug 1, 2018. Aaron Cox, formerly a standout pitcher at Millville High School and the brother-in-law of Los Angeles Angels star Mike Trout, died Thursday at the age of 24, according to statements by the family. Trout, a Millville native and frequent presence in Philadelphia, is married to Cox's sister, Jessica. They mourned the loss and vowed to celebrate Cox's life. The Angels, who had Cox in their minor league system, also released a statement on Twitter. The Angels Organization is saddened to hear of the passing of Aaron Cox, a member of the Angels family since 2015. We are deeply heartbroken and shocked by this tragic loss. Our heartfelt prayers and condolences to his family and friends. Aaron will always have a special place in the hearts of those within the organization. There was no immediate cause of death provided by the family. Cox faced a 50-game suspension during the 2017 season after testing positive for the stimulant Ritalin, a substance banned by Major League Baseball unless a player obtains a therapeutic-use exemption. In 68 minor league appearances, Cox had a 7-3 record and a 3.64 ERA. He last played on May 29 this season for the Angels' High A club Inland Empire but retired from baseball earlier this month. Trout was away from the Angels earlier this week and remains on the 10-day disabled list with a wrist injury. It's not yet clear when he will return to the team.